Weird things happen when a boy plum tree falls in love with a girl apricot tree. Their children produce strange looking fruit with tannic tasting skin and pretty red hued flesh. Unlike an American marriage where the female often takes the last name of the male, the plum tree and apricot tree keep their names, but combine them together for their spotty fruit offspring. Or maybe pluots are just a crazy cross pollination idea from the brain of Floyd Zaiger, a Modesto California fruit breeder. At least he named them something fun, “Ploooooo-ought” rolls off the tongue like an odd foghorn, and is much more exciting to say than “aprium”. So it’s come to be, the fruit with the silly name jumps into my Costco cart. Not having a clue what to do with these strange love children, I baked them into a pie, throwing in a cup of raspberries for brightness. The result is a puckery sweet tart pie with a beautiful red color. Perfect with a cup of coffee for breakfast. 1. To remove the skins: Bring a pot with enough water to cover the pluots to a boil. Set aside a large bowl of ice water. Drop the pluots in the water for about 30 seconds and move to the ice water for a couple of minutes. 2. Pre-heat the oven to 400 degrees. 3. Thickly slice the pluots into a large bowl. Add the frozen raspberries. Stir together the cornstarch and sugar in a separate bowl. (If you don’t do this you’ll have starch clumps). Add the sugar mixture to the fruit and mix gently. Set aside. 4. Roll out the pie crusts just slightly between two sheets of wax paper. This will make them prettier. Transfer one to the pie dish and brush completely with a little egg white mixed with a small splash of water. Pour in the fruit, dot with butter if desired, and top with the second crust. Press the edges together and flute the pie tucking the edges into the pie dish. Poke some holes in the top of the dough the pie with a knife to vent. 5. Bake the pie for 30 minutes. Then turn the heat down to 375 degrees and bake for 30 more minutes or until the bottom of the crust looks lightly browned. You can use a pie shield after the first 30 minutes of baking so the edges don’t burn. Also, sticking a foil covered baking sheet under the pie during the last 30 minutes will help with any run over. There is a plum tree on orchard ave advertising free plums while they last. You wouldn't have to steal them. :P There may not be many left though..
Really? Yay! I'll head down thank-you. What a great narrative! 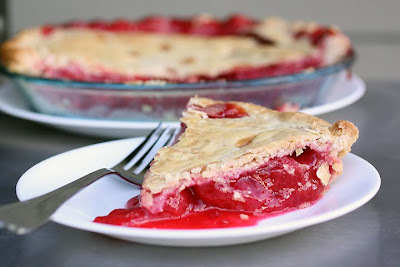 Love the pluot/raspberry pie idea too!!! My mom's pies looked like this.. Oozing and homestyle and comforting. Nothing pretentious and adorned..Just the best. Yum! This looks so gorgeous! Laura, this looks absolutely delicious; I'll bet your kitchen smelled heavenly as it baked and cooled. Thank for coming over to my blog ~ SURE! I would be honored if you want to post about the soup. Have a delcious day! xo~m. Oh what a fabulous pie! I love the combo of fruits, Im always looking for ways to use pluots in new ways! ha ha....you gotta love pie for breakfast! and a beautiful pie at that! I have just discovered pluots and I must say that when they are very ripe, they are absolutely delicious. I bought some today that weren't quite so ripe and they are pretty tart. Your pie looks delicious. I love your narrative and that recip also sounds pretty darn good. I've never heard of pluots! They sure make a delicious looking pie! This sounds wonderful! I always wondered how pluots would work in baking. I say you pronounce it with a French accent and it'll only sound chic! I LOVE the look of this pie. How I love tart red fruit pies. Yum! Save me a slice of this one!